This small book, only 6 by 7.5 inches in size and 152 pages in length is jam-packed with information about how we perceive and understand what we perceive in our consciousness. 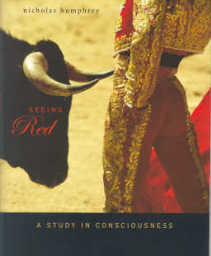 The book cover shows a bull "seeing red" in the toreador's red cape and directly you open this book, you as the reader will see red on the facing page of page one. (See above.) 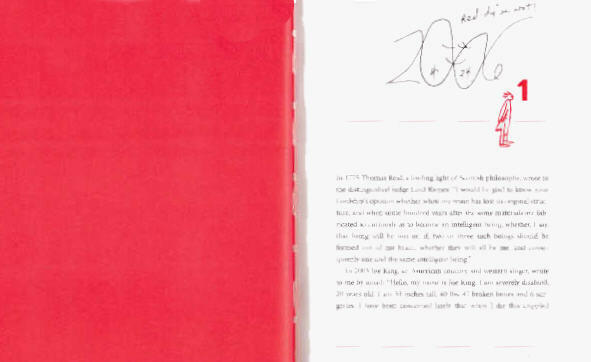 Each succeeding chapter repeats a full page of red on its first page, so you will be reminded of the basic theme which is: How do we perceive sensations such as color? Red is the color used as an example for discussion purposes. Consider that my perception of the color red is a private matter. No scientists are able to come into my head, see what color it is that I call red when I observe a red object, and compare it to what color they see when they see the same red object. "Ah," you may be thinking, "but scientists can measure the wavelength of the object you see when you see a red object and determine that it is a red wavelength of light that is falling on your eyes." Yes, and as a physicist myself, I can guarantee you I know a lot about wavelengths of light. That is not what I'm talking about. I am also not talking about color-blind people either. I have no color-blindness. I look at the wavelength scientists call red, let's call it W(red) for short, and perceive a color, but that color I perceive, call it C(red), no one can get inside my head to perceive. They perceive a color which they call red when they perceive W(red), but I cannot get into their head to compare the color they see to the one that I see! It is physically impossible to do that. If I could, I might determine that the color they see, C(red), when they gaze at W(red) is equivalent to the color C(red) I see when I gaze at W(green). There is no way to tell if that is so or not, lacking some way of getting inside another's head. 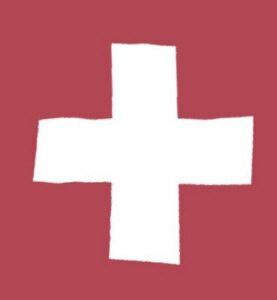 Without that ability, we pretend that the color I see when I look at W(red) is the same color you and everyone else sees when you look at W(red). To my knowledge, no one has ever before pointed this fact of life out. It was my curiosity about this point which led me to buy and read Nicholas Humphrey's book, Seeing Red. I hoped that perhaps he would bring up this subject or at least provide me a way or opportunity to discuss my insight that C(m, red) is not necessarily equal to C(n, red), that is, that the C(red) that person m sees is not necessarily the same as the C(n, red), the C(red) that person n sees. He has provided me with ample opportunity to investigate my insight and develop the nomenclature above to enable me to discuss it. Using the above nomenclature allows me to talk about color-blindness. For example, red-green color-blindness is the case when a person sees C(green) when she looks at the W(red) and vice-versa. We can easily determine that she is seeing C(green) by comparing what others report when they see the same object, namely that they see C(red) when they see the W(red) object. Humphrey discusses a device for blind people which, when pointed at a W(red) object, says the word, "Red". We could simply use this device for detecting color-blindness. What is actually used is a sheet of colored dots which only display a number to color-blind vision and not to normal color vision. We assume that in normal color vision the C(m, red) is the same as C(n, red) when both look at W(red). This leaves open the possibility that every person looking at W(red) sees a different C(red) or, in the general case, that C(m, x) is not equal to C(n, x) where x is any color. This allows for a different color to be perceived by everyone so long as that color for one person is always connected to the wavelength of the color that other people see when they look at the same color. The world may be infinitely more interesting than we suppose it to be when we pretend that C(m, red) is the same as C(n, red), i.e., that everyone sees the same color when they look at a red object. [page 2] The British psychologist Stuart Sutherland, in his Dictionary of Psychology in 1989, gave a curiously sardonic definition of consciousness. "Consciousness is a fascinating but elusive phenomenon; it is impossible to specify what it is, what it does, or why it evolved. Nothing worth reading has been written about it." [page 4] The philosopher Tom Nagel has written, "Certain forms of perplexity — for example, about freedom, knowledge, and the meaning of life — seem to me to embody more insight than any of the supposed solutions to those problems." It is as if both men and Humphrey are saying that the questions raised by consciousness are more interesting than the answers provided to date. And yet Humphrey seems to have adopted this as the theme of this book: to provide some answers to the questions of consciousness, especially the perplexing question of does our individual consciousness survive after death. Two questions came to Humphrey from Joe King (page 1, 2), a country and western singer, in 2003, "I have been concerned lately that when I die this crippled body might be all I have. My question is. Do u(sic) believe consciousness can survive the death of the brain? Is there good scientific evidence for this?" King asks two questions 1) belief about survival and 2) good scientific evidence. It is clear to me that any good scientist, such as Humphrey is, would give the same answer to both questions, namely, "not a chance." And that is the answer that Humphrey will give King on page 133 at the end of the book. By giving that answer, Humphrey is confirming, to my mind, both Sutherland's dictum "that nothing worth reading has been written" about consciousness and Nagel's observation that the perplexity of consciousness contains more insight than any solution to it. [page 10, 11] S is doing whatever it amounts to for a person to "see red" — doing it, presumably, somewhere in his brain. This fact about S is an objective fact. There is every reason to suppose it could be confirmed by a physical measuring instrument — if not with present technology, then soon enough. What is happening in S's brain is presumably similar to what happens in the brain of any other person who sees red, and its particular signature should be detectable in a high resolution brain scan. Here Humphrey and I part ways because I believe that no brain scan, no matter how high its resolution, could confirm the existence of the color perceived by a person's brain. And even if a brain scan could do that, it would only give us the same response to every normal color vision person's observation of the W(red), and that response would be labeled by the technicians as red. In this next passage Humphrey hints at this possibility. [page 12] S is indeed the subject of the experience of seeing red. Which means to say S is the what of what exactly? Being the subject of a visual experience is a complex, layered phenomenon, whose components are not easy to sort out. There is the story told of an Oxford philosopher who gave lectures one term on "What do we see?" He began hopefully with the idea that we see colors, but he abandoned it in third week and argued that we see things. But that would not do either, and by the end of term he admitted ruefully, "I'm damned if I know what we do see." Humphrey creates the diagram in Figure 5 (page 43) to help us differentiate between the propositional component and the phenomenal component of the subject S's seeing red or redding. When S sees the red screen, two facts are apparent: a is the fact of the screen being present, and b is the fact of the experience of red within S. He explains, "let me . . . suggest . . . that having a red sensation has something of the character of a bodily action, perhaps an expression." (Page 15) "This sensation, this redding, is the centerpiece of what it's like to be S at this moment. "S's ideas about the facts are labeled in the figure: p(a) about the screen and p(b) about S's experience of the screen. Humphrey, in contrast to previous investigators, gives priority of his attention to the phenomenal aspect or p(b). This is the direct experience by S of the redding S is doing of the screen. The redding, he says, has "subjective psychical properties which the image as such could hardly have." [page 19] The sensation represents not just the red light at his eyes but his interaction with this stimulus. And because of this, S will feel the sensation matters to him; he will mind about it. The painter Kandinsky wrote, "Color is a power which directly influences the soul. Color is the keyboard, the eyes are the hammers, the soul is the piano with many strings." But even a single color sensation, such as this redding, playing all on one note, can have considerable impact — not only on human beings but in animals as well. The feeling sensation represented by b in Figure 5 seems to exist in a parallel path to the visual sensation a. In the science of doyletics we find an explanation for the parallel paths, the visual sensation a goes directly into the visual processing area of the neocortex and is stored for future reference as a cognitive memory or cogmem. The feeling sensation b is a bit more complex because how it arises depends on the age of the human being. Before five years old, a feeling sensation b is stored in the limbic structure of the brain as a record of the current bodily state, as a doylic memory or doylmem. After five years old (1), any visual sensation a which corresponds to some feeling sensation b that was stored before five years old will cause b to arise in real-time. The cogmem a causes its associated doylmem b to arise. To understand how this works consider that a baby in the womb is seeing light only through the walls of its mother's body and light passing through flesh has a reddish tint. The most exciting physical body states of a young baby's life are stored during the passage through the birth canal, so it would make sense that the doylmems of that event, when triggered later by the presence of red light, would create strong feelings of excitement and disturbance. That is exactly what Humphrey reports, even for babies of a couple of weeks old. Likely the first experience of blue that a baby has in post-birth when its eyes open in the world where things are non-red, lighter-colored, and more peaceful. Those peaceful doylmems would be stored at that time. [page 20] Human beings . . . generally respond to colored light in similar ways. They describe the sensation of red as strong, hot, exciting, and disturbing. Red light has been found to induce physiological symptoms of arousal, while blue light has the opposite effect, and this is true even in babies as young as fifteen days. Subjects feel warmer in red rooms than in blue, time seems to pass faster, reaction times go down. Humphrey writes about Isaac Newton's penchant for having a crimson color for all the furnishings of his London apartment, and asks the following question which involves a new technology called vOICe which converts visual information into audio information to aid blind people in getting around. If S points one of those vOICe devices to the screen in Figure 5, he could push a button and get the reponse RED. [page 25] Suppose Newton, wearing a blindfold, had been obliged to make do with a voice telling him that his curtains and settes were colored CRIMSON. Would his expensive furnishings have had any of the desired effects? This is a question which is easily answered with the science of doyletics. The effects of color upon a person is idiosyncratic, that is, it depends upon the specific life of a person before five years old. Since all doylic memories or doylmems are stored before five, only those bodily states experienced by Newton would have been stored. Perhaps his pre-birth states were not a source of irritation(2), but a source of intense pleasure. Then the presence of crimson furnishings would be a source of pleasure and being anywhere else in a non-crimson environment would be a source of irritation. Now for the answer to Humphrey's above question: Yes. A blindfolded Newton, hearing that he was in a crimson room from his vOICe sunglasses would likely create an image of his favorite room and feel the same way as if he had seen the room. The internal cognitive memory or cogmem is as equally likely to trigger Newton's associated doylmem of crimson as a live image of the crimson room. As Humphrey takes a look at what Thomas Reid said about the double character of sensory experience, we can spot the real-time sensation and notice that it can be separated from the doylic memory sensations which arise from it. We all know people who like some smell that we don't care for — this is easily explained by the idiosyncratic nature of doylmems in each person. For me, honey tasted horrible, or I though so, until I recalled that my mother only gave me honey with foul-tasting castor oil in it. I hated honey, both smell and taste, until that time. I had done an unconscious doyle trace to remove the doylmem of revulsion that had led me to think I disliked honey. What I disliked was the way I felt when I smelled or tasted honey due my stored bodily states or doylmems. [page 40, 41] "The external senses have a double province — to make us feel, and to make us perceive. They furnish us with a variety of sensations, some pleasant, others painful, and others indifferent. At the same time they give us a conception and an invincible belief of the existence of external objects. . . . The agreeable odor I feel, considered by itself, is merely a sensation. It affects the mind in a certain way; and this affection of the the mind may be conceived, without a thought of the rose or any other object. This sensation can be nothing else than it is felt to be. Its very essence consists in being felt; and when it is not felt it is not. . . . Perception [by contrast] has always an external object; and the object of my perception, in this case, is the quality in the rose that I discern by the sense of smell. . . . Observing that the agreeable sensation is raised when the rose is near, and ceases when it is removed, I am led by my nature, to conclude some quality to be in the rose, which is the cause of this sensation. The quality in the rose is the object perceived." One might suppose equally as well that the pleasant sound of a man whistling would cause an agreeable sensation to arise in one, but a doylic memory, whether of the smell of roses or of the sound of whistling, is unique for every person, dependent as it is on one's personal experiences before five years old. One woman I assisted would go into a frightened terror at the pleasant sound of a man whistling in the dark. This was due to an idiosyncratic doylic memory, which, once removed, allowed her to enjoy the sound of such whistling again without the presence of heart-pounding terror. The quality of the whistling was not predominantly the sound she perceived, but rather the doylic memory of terror which arose from the sound. Reid's "led by nature" Humphrey tells us is what later philosophers would call "unconscious inference." (Page 42) The process of unconscious inference, I would call doylic memory inference. One can postulate that doylic memory inference is the factor at work in the phenomenon of "blindsight." I first encountered Blindsight in the Lawrence Weiskrantz book, Blindsight, and his book, Consciousness Lost and Found, in 2001. 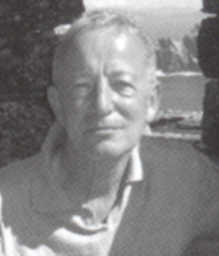 Now I discover that Nicholas Humphrey was a PhD student at Cambridge University in 1967 with Weiskrantz as his supervisor. Humphrey suspected the existence of blindsight in a monkey and began experimenting on a monkey named Helen who had her primary visual cortex removed. Here's his story of a monkey that is proven blind, but is apparently able to see anyway. [page 43, 44] The first hint I myself had that a condition like blindsight might exist came through research with a brain-lesioned monkey, begun when I was a PhD student at Cambridge University in 1967. A monkey in my supervisor Larry Weiskrantz's laboratory, named Helen, had undergone a surgical operation which removed the primary visual cortex at the back of her brain, with the purpose of discovering more about the role the cortex plays in normal vision. The operation had been done in 1965, and during the following two years the monkey had seemed to be almost completely blind. However, I had reasons for thinking this might not be the whole story. And so, one week when I had time on my hands and the monkey was not involved in Weiskrantz's research, I decided to find out more. [page 138] In studying the visual-response of single cells in the sub-cortical visual system of monkeys, I had found evidence that this "primitive" system, which remains intact after removal of the visual cortex, might be capable of supporting finely-tuned visually guided behavior. With this revelation, a mystery was cleared up for me in my role as Principal Researcher in the science of doyletics. If the neocortex with its visual processing and storage capabilities only came into prominence in recent evolutionary times and in the individual human starting storing images at age three and was fully operational at age five, then how could visually triggered doylic memories be stored even before the age of three? There must be some storage mechanism for visual information pre-three years old. That mechanism is clearly the sub-cortical visual system. 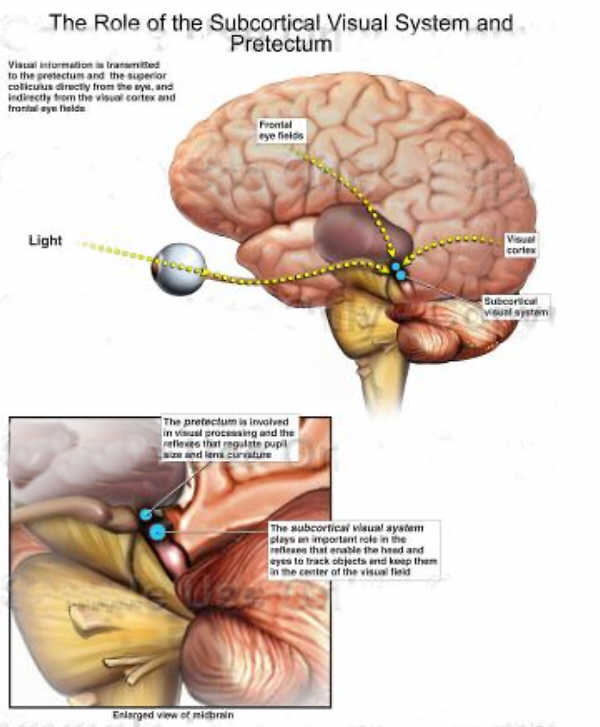 To quote the medical illustration above: "The sub-cortical visual system plays an important role in the reflexes that enable the head and eyes to track objects and keep them in the center of the visual field." What if the object being tracked was that shadow on the back of a cave of a lion walking across the front of a cave? If a one-year-old child and his mother both saw the object at the same time, the mother (knowing the danger from lion) would tremble in fear and the child, not knowing about the danger from the lion, but taking the lead from its mother, would tremble likewise. The child would store the doylic memory of both the visual information of the object's movement (as processed by the sub-cortical visual system) and bodily states of trembling and fear. That doylic memory would arise in the child grown into an adult if some object resembling the shadow of the cave lion appeared and it would cause the adult to tremble in fear. This is how humans learn to tremble at shadows. One more modern example might involve a child watching in delight as a large roach crawled across the floor when its mother let out a scream. From then on, the roach would cause shivers of fear from the doylic memory stored when its mother screamed at the sight of the roach. When a doylic memory is tracked down and erased, all the visual components of the original event, the lion's shadow or the crawling roach, are stored in the neocortex's visual area. Often these newly created memories are dim and obscure because their origin was in the primitive visual area of the sub-cortical visual system. This area is the one which provides reflex tracking of objects for the eyeballs, and is not thought to be an important source of visual information, up until now. With the science of doyletics, we can now understand that this primitive portion of the brain contains all the visual records of our pre-Memory Transition Age (before five) lifetime. To convert these into accessible visual images requires that one wish to remove the bodily states which arise unconsciously and spontaneously and then do a doyle trace. Once the original event is encountered, the visual components are stored as a cognitive memory and the bodily states are effectively erased. These states remain stored, but any future visual information which would have previously caused the bodily states to arise will henceforth only feed up the visual information stored during the trace in the neocortex. In other words, the doylic memory has been replaced by a cognitive memory. Clearly it is time for medical science to update the significance of the sub-cortical visual system — the visual information it captures is stored as the visual component of all events one experiences before five years old. This primitive visual information is stored along with the bodily states and when the visual data of an original event appears, the bodily states associated with the visual data arise necessarily, every time, until one does a conscious or unconscious doylic memory trace. Humphrey explains further how he experimented with the monkey's ability to use its sub-cortical visual system. [page 44, 45]	Over several days I sat by the monkey's cage and played with her. To my delight, it soon became clear that this blind monkey was sometimes watching what I did. For example, I would hold up a piece of apple and wave it in front of her, and she would clearly look, before reaching out to try to get it from me. As the game continued, she soon transformed herself from a monkey who sat around listlessly, gazing blankly into the distance, into one who was interested and involved in vision again. I persuaded Weiskrantz to let me go on working with Helen. Over the next seven years I took her with me to Oxford, and then back to Cambridge, to the Department of Animal Behaviour at Madingley. I became her tutor on a daily basis. I took her out on a leash in the fields and woods at Madingley. I encouraged her and coaxed her, trying in every way to help her realize what she might be capable of. And slowly but surely her sight got better. Eventually she could, for example, run around a room full of obstacles, picking up crumbs off the floor. Anyone who was unaware that she had no visual cortex could well have assumed she had completely normal vision. The monkey apparently had remnants of vision in the absence of any cortical visual cortex. This confirmed to me the existence of some more primitive visual cortex accessible to the root brain and not located in the more recent, evolutionary speaking, neocortex. The search for this evidence first led me to read Weiskrantz's two books on blindsight, but it was by reading this first-person account of the man who first suspected the existence of blindsight, Nicholas Humphrey, that concluded my search successfully. Humphrey goes on to explain the primitive nature of her vision and how he suspected that she was not conscious of what she was seeing. [page 45] Yet I was pretty sure her vision was not normal. I knew her too well. We had spent so many hours together, while I continually wondered what it was like to be her. And, although I found it hard to put my finger on what was wrong, my sense was that she still did not really believe that she could see. There were telling hints in her behavior. For example, if she was upset or frightened, she would stumble about as if she was in the dark again. It was as if she could only see provided she did not try too hard. If one with blindsight were using their primitive sub-cortical visual system as an aid to sight, it seems logical that when one became upset or frightened, that primitive visual system would likely get overloaded by having to feed the visual components of the doylmems and this would prevent the visual system from being used for original seeing. This would explain why Helen the monkey seemed to become blind again as soon as she got upset or frightened. [page 45] In 1972 I wrote an article for the New Scientist, and on the front cover of the magazine they put the headline, under Helen's portrait, "a blind monkey that sees everything." But this headline surely was not right. Not everything. My own title for the paper inside the magazine was "Seeing and Nothingness," and I went on to argue that this was a kind of seeing of which we had never before had any inkling. The next phase of research with human beings confirmed what Humphrey had suggested, namely, that the visual information coming in when the visual cortex was removed was unconscious information. This corresponds to what researchers in doyletics have found over the years — the visual information which triggers a doylic memory is unconscious. Only after a doylic trace has removed the unwanted bodily state by converting the doylic memory into a cognitive memory does the person gain conscious access to the visual component of the memory. Before the trace, one may know that it is some visual information triggering the bodily states because if one closes one's eyes, the doylic disturbances go away. One example is closing one's eyes when one is scared and one calms down. Acrophobia, for example, can go away if one closes one's eyes or doesn't look down. [page 45] With a monkey, who could not describe her inner world, there seemed no way of knowing what her experience was really like. To find out, we would need evidence from human beings, and at that time there were no human cases comparable. What evidence there was suggested that people with similar brain damage would not recover vision. I wrote: "When people suffer extensive damage to the visual cortex it is said that their blindness is total and permanent. Perhaps with a more flexible definition of vision, it will yet be discovered that there is more to seeing than has so far met either the clinician's or the patient's eye." When one does a doylic trace to remove some troubling bodily state, and afterwards asks, "What's a plausible thing could have occurred to me at the age the doylic memory went away?" one often gets a visual memory of the original event during which the doylic memory was stored. These are in people with fully operational visual systems, who unbeknownst to them or the medical community have a dual visual system: a sub-cortical visual system that provides records of events before five years old and a cortical visual system which provides records of event after five. Since doylic traces are done after five, the sub-cortical visual system simply feeds up to the cortical visual system its information and thus one is able to be thereafter conscious of visual information that was heretofore unconscious. The reality of the blindsight phenomenon in people with a removed visual cortex has been confirmed and it is time to accept the reality of the visual phenomenon doyletics has uncovered for over thirty years of the existence of unconscious visual memory in humans with an intact visual cortex. [page 46, 47] Then, within a couple of years, Weiskrantz, spurred on by what we had found with Helen, moved the research to a new level by showing that a human patient with extensive damage to the visual cortex could be coaxed, like the monkey, into demonstrating a significant degree of vision in the blind part of his visual field. But now, with this human patient, it was possible to have him tell the researchers what it was like for him. And, to everyone's astonishment it turned out that, yes, this was indeed a kind of unconscious vision. The patient believed he was blind, and reported that he was having no visual sensation, and yet he could still guess the position and shape of objects. What's more, it later turned out that he could also accurately guess colors. So this patient, were he here now, with the screen in the blind part of his field, though he would say he had no red sensation, could still tell us that the screen is colored red. The reality of blindsight has now been confirmed with a dozen or more patients. I shall want to come back and mine it for further revelations later. But the immediate point is this: the existence of blindsight is as good a proof as we could ask for that visual perception does not necessarily have to involve sensation. If the serial pathway of Figure 5, from sensation to perception, exists at all, it clearly cannot be the only pathway. There must be an independent pathway that does not go via sensation, which can be used when sensation is not present. Humphrey asks the wrong question in the above paragraph because he doesn't have access to the unconscious visual system, which we might call doylic vision. This is the visual data which is recorded unconsciously by the sub-cortical visual system which is known mostly for providing reflex action for our eyes, but has also the capability of storing primitive visual images. Doylic vision is the independent pathway he seeks. When the medical paradigm is expanded to include the concepts of the science of doyletics, many previously puzzling phenomena such as blindsight will be readily understood and explained. Doylic information arises in parallel with the visual information one receives. If one sees a roach and becomes frightened, there are two aspects of information being received: the visual information of the roach and the doylic information of the fear. These dual pathways of information provide a clue as to what is happening in blindsight. If one had a warm feeling when one saw a red field before one lost one's visual cortex, e.g., a blindsight patient, then if one is presented with a red field, the conscious visual data may be unavailable, but if the unconscious visual sub-cortex triggers a doylic memory of a warm feeling, the patient could identify that feeling as associated with a field of red, and thus give an informed guess of "red". In studying the hallucinations which occur under peyote and LSD, neuropsychologists may find a separation between experience and function, but Humphrey sees two parallel pathways of sensation and perception. To me these are the parallel pathways of information arriving in the human being from conscious perception and unconscious-doylic-memory-created bodily states. [page 49, 50] The neuropsychologist Stephen Kosslyn has commented, in relation to metamorphopsia: "This dissociation between experience and function is fascinating, suggesting that the experience is produced by a collateral process . . . outside the 'chain of command' that results in recognition. If so, then this collateral path can be disrupted while the main one is left unimpaired." Kosslyn's suggestion is, I think, right on. The only reasonable inference is that sensation (which is clearly what he means here by "experience'') is indeed "outside the chain of command" that leads to perceptual recognition. However, neither Kosslyn nor Weiskrantz nor others who have thought about these strange phenomena have as yet been ready to follow where, to me, they seem to obviously lead. If sensation can be side-lined, then doesn't this mean that sensation is in reality some kind of side show? It might be going too far to suggest that sensation plays no part in perception. But I think the weight of evidence really does suggest that sensation and perception, although they are triggered by the same event, are essentially independent takes on this event, occurring not in series but in parallel, and only interacting, if they ever do, much further down the line. The next subject Humphrey covers is substituting one sensory input for another, first done by Paul Bach y Rita in the 1960s. The vOICe apparatus mentioned earlier is primarily designed to create a "soundscape" of a person's environment to enable a blind person, e.g., to quickly recover a dropped walking stick. One researcher, Peter Meijer, using the vOICe device, suggests that auditory data could become the qualitative equivalent of normal vision. This is exactly what I suggest in my novel about dolphin communication, The Spizznet File. I explain how there is evidence that dolphins and other cetaceans communicate by speaking pictures, that is, they create three-dimensional images of their environment with one set of phonation equipment (erroneously labeled "echolocation") and then speak the sounds they heard which created the image to communicate to other cetaceans. They speak-visualize or spizualize. By creating a device, a spizznet, humans would be able to communicate with cetaceans. [page 36] Meijer himself poses the question: "Is it Vision? Can it be?" It is clear that he thinks it surely can be. He says: "Our assumption here is that the brain is ultimately not interested in the information 'carrier' (here, sound) but only in the information 'content'." In other words, he sees no theoretical reason why auditory vision could not be the qualitative equivalent [italics added] of normal vision. Even so, he stops short of claiming that the evidence of his studies confirm this. My evidence of the cetaceans speaking images is described in my Spizznet novel. It involves a detailed communication over hundreds of miles instantaneously which allowed the cetaceans, a group of orcas, to distinguish between ships with a harpoon gun mounted from those without a harpoon gun mounted. The easiest way to explain how these orcas could have communicated this information about a minor feature on a ship would be via visual data. If the visual data also included three-dimensional movie-like action of the harpoon coming out of the gun and impaling and killing another orca, the message to stay away from ships with such a gun would be immediate and dramatic. The orcas in fact did move away from the ship some 200 miles distance at the same time the harpoon entered the orca according to the ships' logs. Is this evidence of visual communication between cetaceans? I thought so, and all my subsequent research confirmed that the capability exists in dolphins and other cetaceans to do just that. What I found in the dolphins were two phonation devices which can operate simultaneously, apparently one for hearing visual information (phizualizing) and one for speaking visual information (spizualizing). In addition, the most important clue, is that the percentage of higher cortex devoted to auditory processing versus visual processing in the cetaceans and humans is reversed! This told me that dolphins process auditory data so that it becomes the qualitative equivalent of human visual data. And human process auditory data to the qualitative equivalent of dolphin visual data. Dolphins, in other words, can see with their ears as well as we humans can see with our eyes. We humans can hear with our ears as well as dolphins can see with their eyes. As we use auditory information to supplement our visual data, dolphins use visual data from their eyes to supplement what they can see with their ears. To return to doylic memory as the carrier of what Humphrey calls sensation, Humphrey poses an interesting question, "If, as I am suggesting, sensations are not involved directly in perception, then what are they involved in? What's the point of them?" The point becomes clear as one studies the science of doyletics — sensations are doylic memories — they record all pre-five-year old events. Humphrey is puzzled, however. [page 64] But if the brain — or rather the person whose brain it is — is not interested in the information carrier, which is the sensory stimulus, then why ever should the brain of this person go to the trouble of creating an exotic side show that represents the stimulus? This question would be similar to my 6-year-old grandson asking me, "Why did computer scientists ever go through the trouble of inventing floppy disks?" It is obvious at his tender age that floppy disks are bulky, limited in storage, and slow to load memory . Why indeed? Anyone who witnessed the evolution of the Personal Computer knows the answer: The first computer had only floppy disk storage! You had to boot up your computer from a floppy disk and load all programs you wished to run into memory from your floppy disks. The reason for doylic memory is similar to the reason for floppy disks: evolution. Here's my version of how the brain evolved. The first portion of the brain to evolve was the root brain with its later added limbic system. At that time, all experiences of the human being for their entire lifetime were stored in the limbic system. The storage was doylic memory consisting of visual data from the sub-cortical visual system and all physical body states extant at the time of the experiences. These doylmems were what allowed primitive humans to react instantly to avoid danger and take advantage of opportunities and gave them a distinct evolutionary advantage. This advantage was to increase dramatically during the Cro-Magnon epoch, when the root brains of the Neanderthal humans evolved into the larger neocortex brains of the Cro-Magnons. This made cognitive memory storage, conscious memory storage, possible for the first time in human evolution. With the advent of the neocortex came also speech-making capabilities, languages and many other things. The human being, restricted as early PCs were, had their primitive floppy-disk-like memory capabilities expanded to hard-disk-like memory capabilities. Any data stored on a floppy disk can always be accessed later when you added the hard disk, but you could easily store all the data from your floppies unto the hard disk and keep the floppies out of sight. With the human beings, the advent of the neocortex meant that the doylic memories could be kept out of sight (i.e., unconscious) while the events which occurred when the neocortex was added could be kept in consciousness. After many thousands of years of evolution, we have come to call exclusively our conscious memories by the name, memories, and have forgotten the prehistorical time when our only human memories were unconscious memories or doylmems. In continuation of the above quotation, Humphrey asks a key question, the answer to which is easy enough, but requires a knowledge of doyletics. He is correct in his assumption that the capacity was designed-in over evolutionary times. But for what reason? [page 64] Well, people have evolved to have brains that do it. It is fair to assume the capacity has been designed-in by natural selection. So there must actually be good functional reasons for taking an interest in sensation. But what can they be? There were several reasons that come to mind. One was to provide a primitive memory of all events happening to a human being. Lacking the inborn instincts of the animal kingdom, human beings required some way of storing for instant retrieval every event which occurred to them to facilitate their survival. The case of learning to take corrective action to protect oneself when the shadow of a lion crosses ones cave is just one example of the use in sensation in species survival. The second reason is not as obvious because it involves another aspect of being human which we have taken for granted, up until now. That other aspect is the presence of feelings, emotions, and healing states. A basic tenet of doyletics was first promulgated about 1975 by Doyle P. Henderson who had the insight that, "an emotion is a recapitulation of a bodily state stored in childhood." He went on to explore this idea and found that it was possible to remove unwanted bodily states by a long, complicated trace procedure which usually unveiled or brought into consciousness visual aspects of the original event. Once traced, however, the bodily states of the original event never recurred. Over thousands of cases of such traces, Henderson noticed a distinctive pattern: only if he took his subjects to five years old or below was the removal permanent. It was this experiential observation from which the Memory Transition Age was conceived. [page 65, 66] Blindsight is an unexpected and remarkable capacity. Nonetheless, we should recognize that it falls far short of normal sight in a number of crucial ways. And, interestingly enough, there seems to be a common theme to what is missing: namely that a subject who sees without sensation finds that in one way or another he no longer feels that his seeing has anything "to do with me." Which is, of course, just what we might expect to be the result of removing the component of experience that is "to do with me" — the component that is intrinsically creative and personal. The third reason is that the sum total of all our stored experiences as they come to meet us at every waking moment in the form of feelings of comfort or discomfort combine to inform us that "this world had to do with me" — that this person I am is me — the continuous "me" since I can remember and even before them, the me since I was gestating in the womb. If something novel happens to us, such as an illness or the loss of some key memory, we might say, "I don't feel like myself today." What is it that we are comparing our current state to when we say that? It is the accustomed homeostasis which we find that we have lost, and we therefore don't feel like ourselves during such events. [page 70] What sensation does is to track the subject's personal interaction with the external world — creating the sense each person has of being present and engaged, lending a hereness, a nowness, a me-ness to the experience of the present moment. The "me-ness" we experience is a result of our doylic memories, not cognitive memories. With cognitive memory we simply record the visual, auditory, olfactory, and gustatory components of our experience and feel the sensations released by the doylic memories they trigger. Since the doylic memories arise spontaneously (unbidden by us consciously) we call their arising a sense of "this-is-me" or "this-belongs-to-me" or simply "this-is-me". It is our familiarity with our personal doylic memories which allows us to say with confidence, "this-is-me." Then Humphrey makes a giant leap by suggesting that the side show of sensation is somehow related to the formation of consciousness. [page 72] If the creation of this side show is what having sensation is, we have taken the first step to understanding what consciousness is. And if these crucial "side-effects" we have identified are some of the thing sensation is for, we have taken the first step toward understanding what consciousness is for. As a physicist, I am well-acquainted with dimensional analysis — the dimensions of the terms on one side of a physics equation must match the dimension of the terms on the other side. If you have a wagon on the left side, the right side must have a minimum of four wheels and a base. To present the problem Humphrey says, "the equation experience of red = redding will work only provided the experience of the redding can be seen to be conceptually equivalent." [page 84] If sensation is indeed like a kind of bodily expression, then the activity of redding must also be like a kind of bodily expression. The activity of redding and its resulting sensation can be seen as two types of memory and this completes the necessary dimensional analysis. Redding is a cognitive memory stored in the neocortex and the resulting sensation is a doylic memory stored in the limbic region of the root brain. Both are of the type memory. Now we are ready to answer the two questions about what is happening to me and what is happening out there in the world. [page 91, 92] When the question is "What is happening locally to me?" the answer that is wanted is qualitative, present-tense, transient, and subjective. When the question is "What is happening out there in the world?" the answer that is wanted is quantitative, analytical, permanent, and objective. The answers to these two questions come from our two types of memory. Doylic memory provides the answer to what is locally happening to me. Doylmems are filled with qualitative, present-tense, transient, and subjective (because they are idiosyncratic) answers and they arise unbidden, every time for the rest of our lives (unless traced and converted into cogmems). Cognitive memory provides the answer to what is happening in the world. Cogmems provide us with veridical data that can be permanent, quantitative, objective and which will hold up under analysis. The next subject I found of interest was Humphrey's discussion of "mirror neurons." [page 105] . . . suppose, in line with our new understanding of how sensations work, that sensations at the most basic level — sensations of pain, smell, color -- actually are a kind of covert movement. Then the way could be open for imitation of action to have a much wider role in mediating empathy across the board. Not just empathy for moods and emotions, but empathy for purer sensory experiences, too. Imitate someone else's doing the redding and you'll find yourself sharing their experience of a red sensation. [page 108] The essayist Michel de Montaigne was another in whom empathy was nearly on a level with direct experience: "Everyone feels its impact, but some are knocked over by it. On me it makes such an intense impression, my practice is rather to avoid it than to resist it . . . the sight of another's anguish gives me real pain, and my body has often taken over the sensations of some person I am with. A persistent cougher tickles my lungs and my throat." Keep in mind that doylmems are idiosyncratic — not everyone will respond as Montaigne did to someone else's coughing, only someone who has stored a dolymem of coughing during their early childhood. All that is necessary is to observe, or hear, or smell, or taste some portion of a doylmem for the remainder of the doylic memory to arise in onself when it is presented by another person. A doylmem arises by one completing the remainder of the fragment which presents itself in the outside world to one or more of one's senses. [page 106] What's more, this [the mirroring of another's actions] suggests a whole new role for the recently discovered phenomenon of "mirror neurons." These are a type of neuron in the pre-motor cortex of the brain with a remarkable dual role: they become active both when the subject performs a particular action — grasping a nut by the fingers, for example — and when he sees another individual doing the very same thing. Such neurons effectively link the observation of action by someone else to the execution of action by oneself. They were first described in the brains of monkeys and have now been shown to exist in the human brain as well. But if sensations are a kind of action, then the possibility arises that there may be "sensory mirror neurons," in other words neurons that link the observation of someone else having a sensation to the execution of a similar sensation oneself. And indeed there is tantalizing new evidence that there are neurons in the human brain that do in fact have mirror properties for pain. Bill Hutchison has described neurons in the anterior cingulate cortex that respond both when a human subject receives a painful stimulus such as a pinprick and also when the subject observes someone else receiving a pinprick. Many people have had the experience of wincing while watching someone else receive an injection. For myself, I had avoided watching such an event on television — deeming it too painful for me to watch. That was until I had traced and erase my own reluctance to have an injection. When I received my first injection post-trace in the aftermath of Katrina, the tetanus shot didn't bother me at all. And neither has the watching of injections on TV bothered me with the exception of the slamming of a needle into an drug overdose victim’s heart in the movie, "Pulp Fiction." [page 106] Can this really be what it seems? At first we might well question how it can be. The subject cannot actually be observing the other person creating a pain sensation, because the sensory response as such is private. So what exactly can a mirror neuron for pain be mirroring? There is a particular finding in monkeys that arguably holds the key. This is that certain mirror neurons respond not only when the monkey observes another individual performing a complete action but also when the monkey observes the action being completed out of sight — a nut being grasped just behind a barrier, for example. The suggestion is that the neuron imitates the action the monkey expects is taking place. Even though we cannot ask the monkey if that is what he consciously expects, the brain of the monkey has the root brain structure of the human being and the monkey no doubt completes the action, not out of any conscious expectation, but from a doylic memory being fired out in the monkey of having a nut in its grasp and then the reflex action of grasping the nut would take place. [page 107] In our enthusiasm for this explanation, we should be careful, however, not to run ahead of the phenomena. We ought to ask: how like the real thing is empathetic sensation? Does the pain felt by an observer of someone else's pain really hurt? The answer seems to be that, for most people, the reflected sensation does not have the full intensity of sensation elicited directly. Neither	Humphrey nor anyone else can say what someone's imagined pain is like any more than they can say what color another person sees when they experience the Wavelength(Red). The mirrored pain is idiosyncratic — dependent upon the unique set of doylmems stored in one's body at the time when the mirrored pain is experienced. Those people will naturally experience more pain from watching an injection who had a painful injection (or reaction to one) before five years old. Others who had no such experience will have a dramatically lessened reaction. [page 39] Then, with this as the new challenge, let's get going. And let's try, to begin with, to find out more about what sensation is. As we do so, however, it is important that we take on board a kind of philosophical health-warning. We should recognize that, even if sensation is the vehicle and occasion of phenomenal consciousness, the discovery of what sensation is will not necessarily tell us why what it is is conscious. Indeed, we may have to dig still deeper before we understand why sensation's being whatever it is brings with it the extra feature that somehow lifts ordinary sensory experience into the realm of phenomenally rich conscious sensory experience — the mysterious extra feature that the philosopher Daniel Dennett has (skeptically) dubbed "the factor X." It is possible that, as we close in on what sensation is, this X factor will simply fall into our lap. But it may not. We can only try our luck. Perhaps by reading this review, Nicholas Humphrey may decide that the X factor has fallen into his lap. But he asks another rather interesting question about an active agency that might be playing the role of illusionist behind the flow of our lives, such as a magician's assistant does during stage magic. Equating human life to trickery is a favorite ploy of the materialistic scientist or philosopher and Humphrey reveals himself as one in asking and answering this question. [page 127 Now, with belief in mind-body duality, which kind of illusion is it? The general view among materialist philosophers has always been that it is an illusion of the first kind, an honest — if regrettable — error. But how about if it is actually an illusion of the second kind, a deliberate trick! Could it be? Only of course if there were to be an active agency behind it, playing the role of the illusionist. But who or what could possibly be doing this? And what interest could they have in encouraging individual humans to believe in a non-physical soul? The only active agency I know of behind human life is the guardian angel which tracks with each human being from lifetime to lifetime to assist in the karmic working out of an individual human spirit. The guardian angel is not here to create illusions to trick its charge, but to help one uncover the truth about oneself. Though, I think it may be so that for resolute materialists that their guardian angels may have to resort to illusions and trickery, so adamant the materialists are about the non-existence of anything which is not sensory-perceptible. [page 127, 128] The immediate, but unhelpful answer, might be that, since it is a case of self-delusion, the illusionist must lie within the subject's own brain. The more interesting answer might be that, insofar as the brain is designed by genes, the illusionist is the subject's own genes. But, in that case, the ultimate answer must surely be that the illusionist is Nature herself, working through natural selection. [page 133] But my straight answer, as a scientist, is: not a chance. Consciousness is something we do with our brains. And starved upon the residue." The stanza above comprised the very last words of this book, "Seeing Red." As I read these words I recalled that some three months before I bought "Seeing Red" I had bought a book entitled: Hopkins which contained the poetry of Gerard Manley Hopkins, a Catholic, a Jesuit, and a mystic poet. That book has been sitting at my arm's length on my workstation. I walked inside from the patio where I had completed reading "Seeing Red" and picked the "Hopkins" book off my desk. A quick check of the poetry index led me to page 55 where the above poem appeared, but what is interesting is that the poem had one more stanza — a stanza which adds an interesting, off-book twist to Humphrey's last words to Joe King, "not a chance." What was amazing to me is that it only took me the time to walk a few steps indoors to locate the exact poem I was reading outside because the book I needed had been purchased for me by me three months ago! Wow! Must have been the active agency of my guardian angel at work behind the scenes pulling the strings. The last stanza betrays a hidden message that perhaps Nicholas Humphrey was hiding within himself and from his scientist colleagues — an unconscious belief in Christ and the existence of the spiritual world. One can only hope that Joe King went fishing for the entire poem and thus became a "king-fisher" catching fire — the fire of the immortal Self, the I Am, the Spirit! Poem I scribbled on pages 24 and 25 of the book. I taste the rain falling on my tongue. I think that it is raining yet. Footnote 1. It is a fundamental tenet of doyletics that doylmems are only stored before one reaches five years old, and never afterward. This age is called the Memory Transition Age because the human being switches at that age from storing doylmems to storing cogmems. This transition occurs when the neocortex comes into full operation and takes over the process of storing every event as a cogmem. The already stored doylmems provide a full record of early human life, but only as recapitulations of physical body states. Footnote 2. On page 21, Humphrey suggests that Newton used crimson furnishings "to ensure he lived up to his reputation for being irritable." I suggest it may have been the opposite — he was only irritable outside of his private rooms.